Meet friendly people of Sahara dunes while walking through ancestral trucks. If you are fervent of nature and real meetings, �Terre et Voyages� will be your companion and guide for a dreamed trip. Thanks to a professional team, you will discover the magical nature of Morocco. �Terre et Voyages� arranges all your treks in Morocco: Atlas treks, treks in the desert of along Atlantic Coast, pedestal tours to Moroccan Kasbahs and Berber villages, horse rides, camel rides, cycling and 4WD tours towards imperial cities (Marrakech, Fez, Essaouira...). Treks adapted to all tastes: sportive, family, youth, etc. 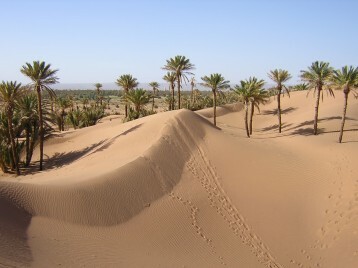 �Terre et Voyages� proposes also creative trainings (calligraphy, watercolour, yoga, cooking), dunes' bivouacs or in a traditional riad, theme hikes, etc. many tours made according to your wishes.